2018 Cannes Palme D’Or Winner! Hirokazu Kore-eda (Still Walking) brings us this story about a family of small-time crooks who take in a child they find on the street. After one of their shoplifting sessions, Osamu and his son come across a little girl in the freezing cold. At first reluctant to shelter the girl, Osamu's wife agrees to take care of her after learning of the hardships she faces. Although the family is poor, barely making enough money to survive through petty crime, they seem to live happily together until an unforeseen incident reveals some hidden secrets. Typically for Kore-eda, the generally becalmed, affectionate tone builds slowly towards scenes that are finally deeply moving. 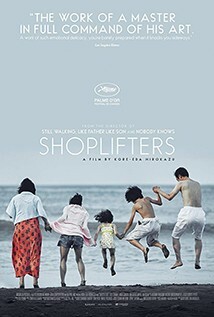 Boasting excellent performances all round, ‘Shoplifters’ is another charming, funny and very affecting example of Kore-eda’s special brand of tough-but-tender humanism.